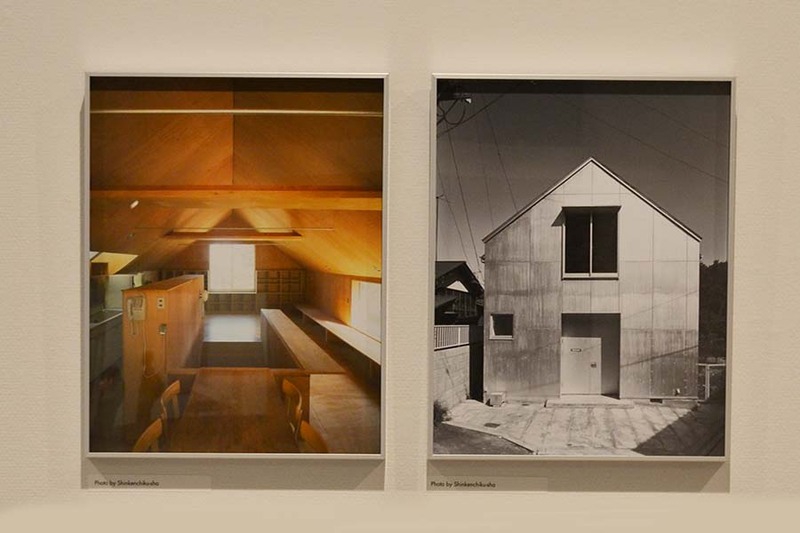 In Chapter 4: “A House is a work of art,” the exhibit “The Japanese House” reviewed Japan in the 60’s through the lens of legendary architect Kazuo Shinohara. 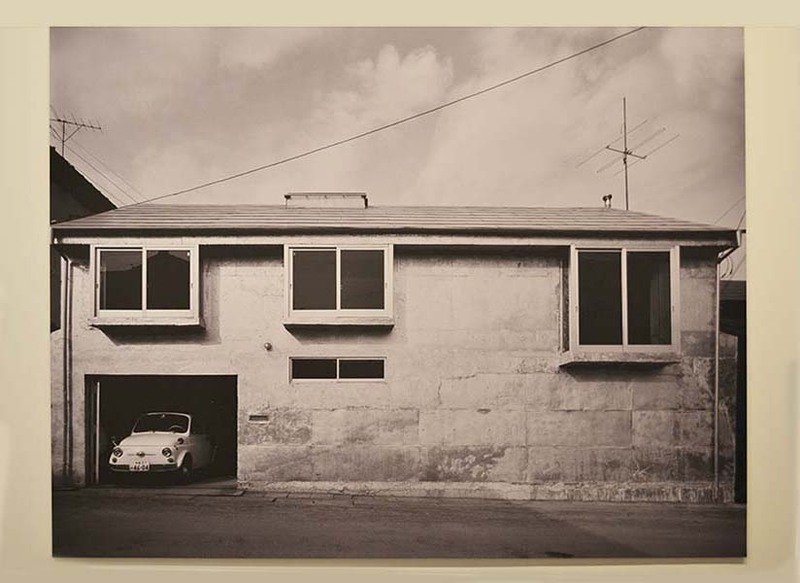 He attempted to leverage houses (private dwellings as opposed to public architecture) as a fundamental vehicle of architectural critique, capable of questioning the impact of modernization, which overwhelmingly favored efficiency. 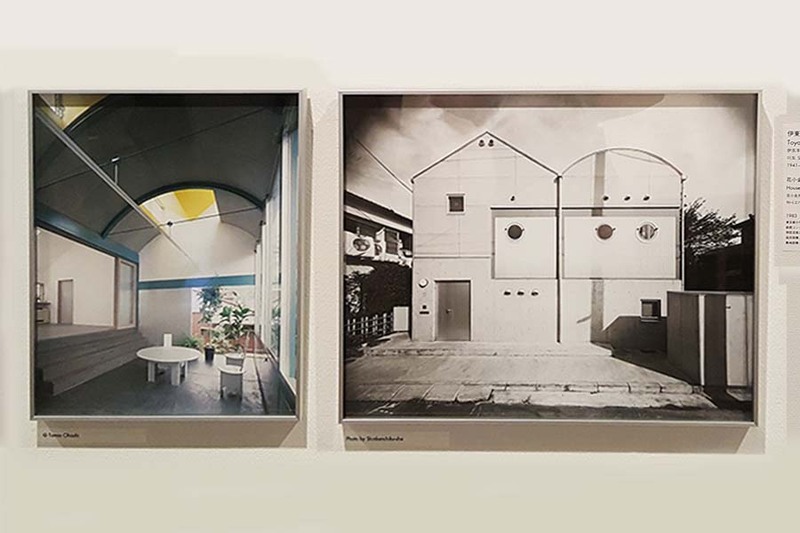 Chapter 5: “From open to close” reviews the 70’s and 80’s, focusing of two young and prominent architects who were influenced by Shinohara: Kazunari Sakamoto and Toyo Ito. After WWII, Japan frantically pursued modernization to recover from devastation – the scorched earth that turned so many buildings into debris. 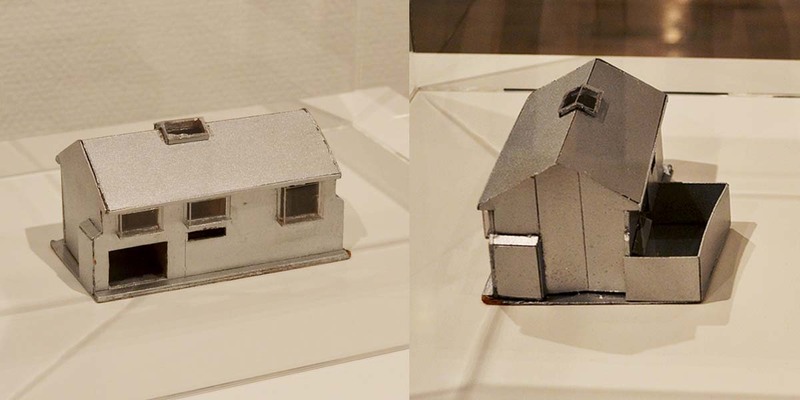 New, semi Western-style, cost-effective house models were developed and mass produced to accommodate displaced people and to support labor for the economic recovery. Efficiency was everything for new developments. This was totally different from how communities were shaped before the war. Through the struggle for recovery, new types of social problems had also emerged by the 70’s: unprecedented population concentration due to drastic urbanization reduced the quality of peoples’ lives, and the pollution became rampant. It was against this background that Sakamoto and Ito distinguished themselves. 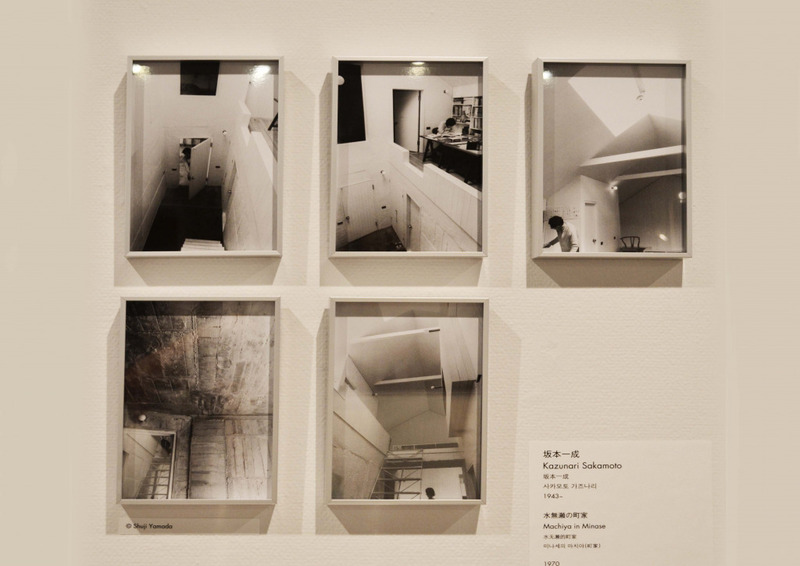 According to Yoshiharu Tsukamoto (Atlier Bow-Wow), the chief advisor of the exhibit, their works ran parallel in a sense, because they were both bold and had keen critical eyes. 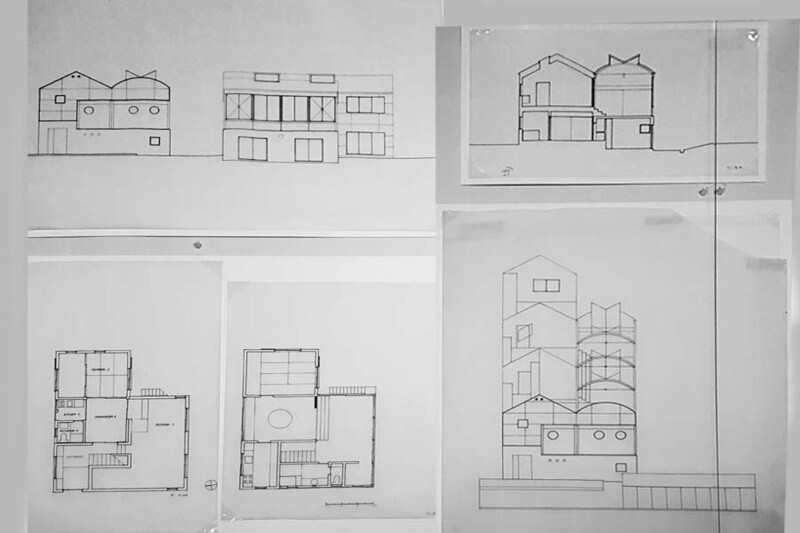 They weren’t afraid of experimenting alternative ways to design houses, and their experiments kept evolving because both were capable of elevating their new projects to the next level by critically examining their past projects. And probably the drastic and radical social changes after WWII in Japan necessitated such an architectural transformation. The changes were so fundamental that they literally rattled the Japanese peoples’ quest for identity. And architecture reflected these social dynamics. The 70’s were turbulent because rapid and unprecedented modernization created various unexpected pressures on society. The avalanche of new urban development caused severe population concentration, which made living and working consuming for people who supported economic recovery. Pollution was everywhere. 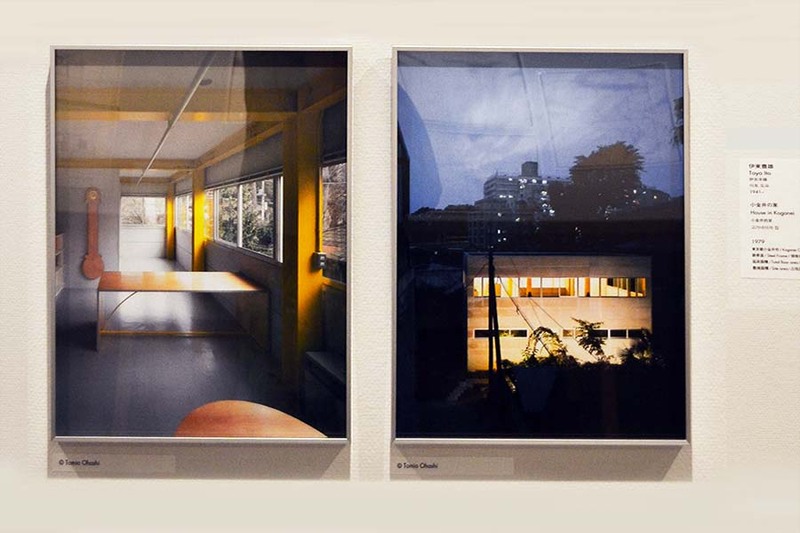 Facing a daunting reality, torn between exciting economic growth and its grim side-effects, both Ito and Sakamoto allowed the idea of a secluded living sphere to emerge, which did not have to interact with the busy, noisy, often ugly and dirty outside world created by relentless modernization. The “Machiya in Minase” is a tiny box-shaped house that faces a busy street. In order to seclude it from the public infrastructure, Sakamoto carefully limited the number and the size of the openings (doors and windows) on the front walls. The enveloping box was further divided into small boxes with designated functions (such as kitchen, bathroom and bedrooms), all of which were placed along the walls. It left an opening at the center, which functioned as a corridor that connected small boxes. Natural light came in from the ceiling, but since it was high above the ground floor, the house retained a “secluded” atmosphere. 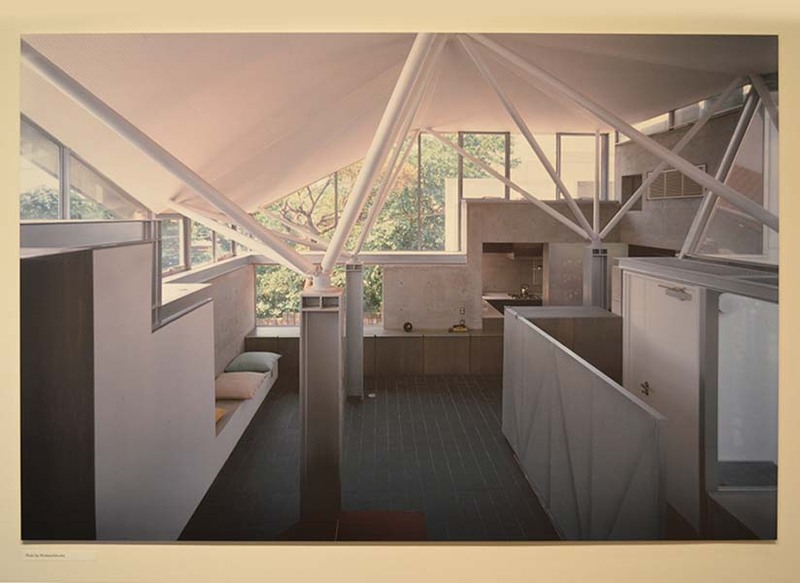 The “Aluminum Hut” was conceived to offer an “industrial-primitive” living environment in the metropolitan Tokyo area, which was expanding at a mesmerizing speed in the 70’s. 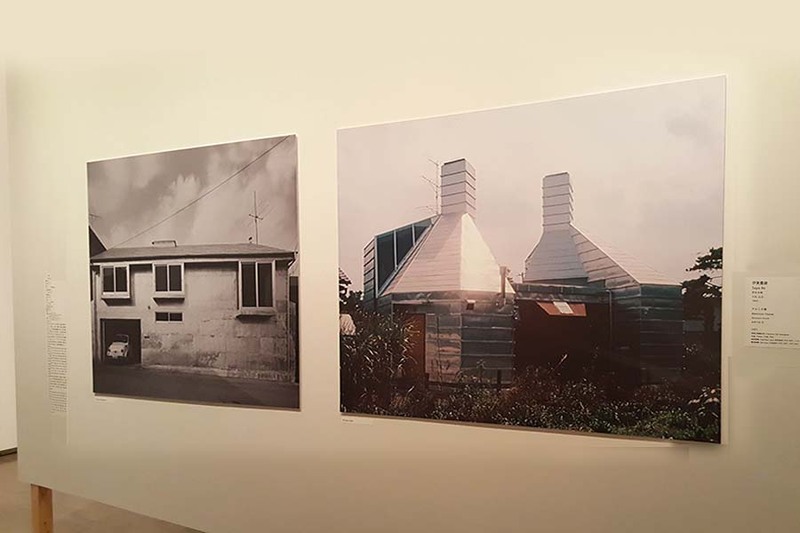 Consisting of two capsule-like, but also barn-like units, the house represented two mixed notions: disillusion towards modernization, and the struggle to pursue the organic, primitive spirit in a big city like Tokyo. Aluminum is flexible and tensile compared to other rigid metals. Ito chose it as a material that represented an industrial-organic crossover. The interior had few partitions and looked like a one large room. The walls were finished with cheap plywood, probably to highlight his disillusion toward rapid industrialization. Whereas their works in the early 70’s were filled with architectural ambitions and experiments, both Sakamoto and Ito’s work became more minimalist in the late 70’s. It might have been influenced by social anxieties such as oil crises. The owner of Ito’s “House in Koganei” insisted on designing a house at the lowest cost possible, and requested eliminating any frills to save money. So Ito decided to use ECP (extruded cement panels), which was an emerging industrial material back then, mainly used in the construction of factories or warehouses. Using a design that was both minimal and universal, Ito positioned this house as a platform on which owners could freely design the interior based on their needs. It sounds like the MUJI house, which also applies minimalist design. But even though it has minimal features, this house retains unique aesthetics. Minimal and plain is not the same. 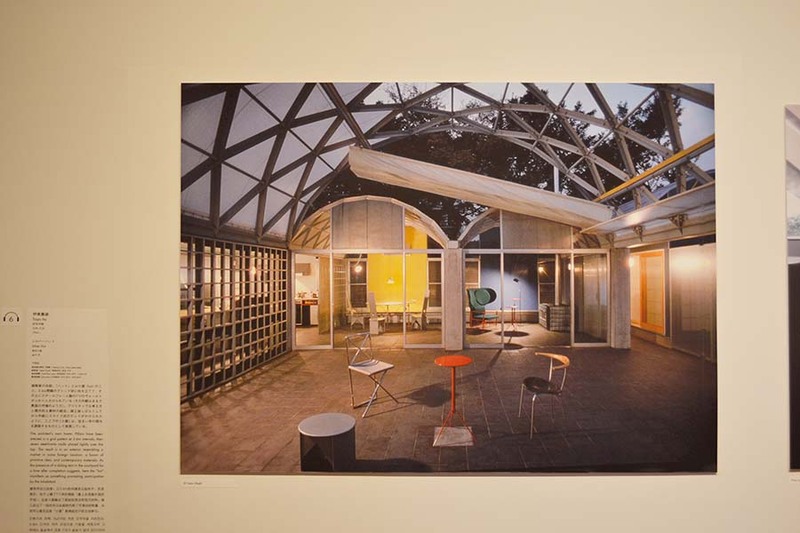 Functionality, which was highly rated – if not overrated – in modern residential house design, could be replaced by emphasized symbolism, where architects could let unexplored beauty emerge by eliminating unnecessary elements. 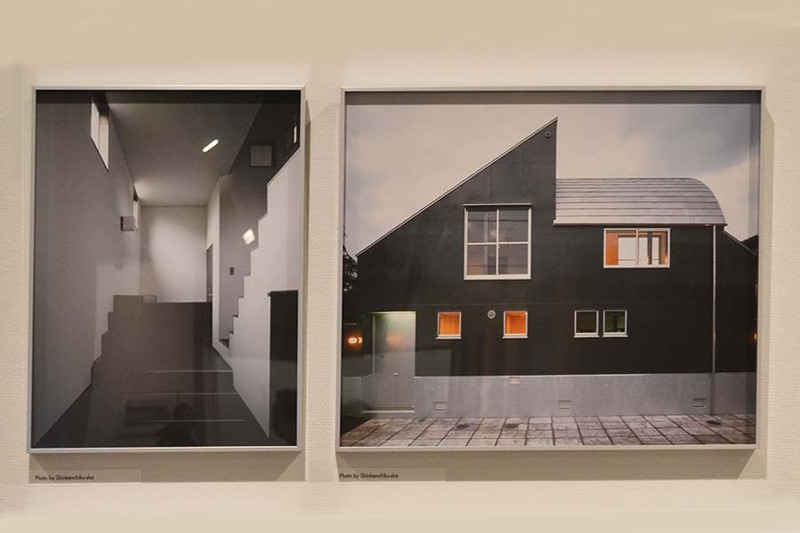 The House in Sakatayamatsuke also applies minimalist design, but it has an interesting theme: what if a symmetry is disrupted? Its front has a sharp minimalist expression because of the steep roofs, the proportion of the roofs/walls, and its metallic finish. Large windows and doors are placed at the center, emphasizing the symmetric aesthetics. But then, there is a small window to the left hand side for a bathroom. It’s small but powerful enough to disrupt the entire balance. The same thing happens in the interior: a large built-in shelf sticks out to add subtle disorder in the space. Symmetry makes things look orderly and clean. But our life is not always orderly – it’s actually pretty chaotic. And if we think about it, architecture is a series of reconciliations of opposing elements and expectations. Gravity wants everything to be stuck on the ground, but we want to go high. Natural elements are almost never linear, but we want to make our architecture linear. The House in Sakatayamatsuke is an answer from Sakamoto on how we can reconcile those opposing elements. The 80’s in Japan was a very weird time. After about three decades of struggle to recover from the devastation caused by the WWII, Japan suddenly found itself to be the world largest economy. In the 80’s, it seems that both Sakamoto and Ito tried to deprive meanings, even from the minimalist symbolism they pursued in the late 70’s. They disassembled architectural elements into fragments and aggregated them in an unexpected way. Their passion could also have been driven by the social mood, in which money was everywhere and people were emboldened to experiment with extreme ideas. The House of Soshigaya is radically dissonant. Half the building has a sharp triangular shape but the gabled roof is cut in half, and the other half has a round, vaulted roof. You can see through the windows that some pillars stand in the middle of the rooms, which suggests that the walls and the load-bearing structure are totally separated. If you go inside, you are welcomed by an overly wide corridor. The exterior is painted black, the floor is black but the ceilings are white. As was the case with the House in Soshigaya, the House of Hanakoganei by Toyo Ito also has two distinct roofs. You can see the gable roofing on the left hand side, and the barrel vault on the right hand side. The gable roof has ceilings like a regular house, but the structure of the vault roof is exposed, as shown in the image on the left. The right half of the house functions as a buffer to loosely connect the outside with the inside of the house. Conceptually, the space under the vault roof is a “doma,” which means “dirt room” in Japanese. Although Ito’s doma looks more sophisticated than a traditional one, it definitely sets the tone by allowing the entire house gradually open towards the outside. Sakamoto’s House F has uniquely shaped roofs, which are made by assembling folding plates that come in different angles and sizes. They are supported by H beams, but those beams don’t support the house itself. Inside the house, the floors are on multiple levels and walls come in different heights. Because unconnected elements are put together, House F gives some sort of primitive impression despite its use of modern materials. 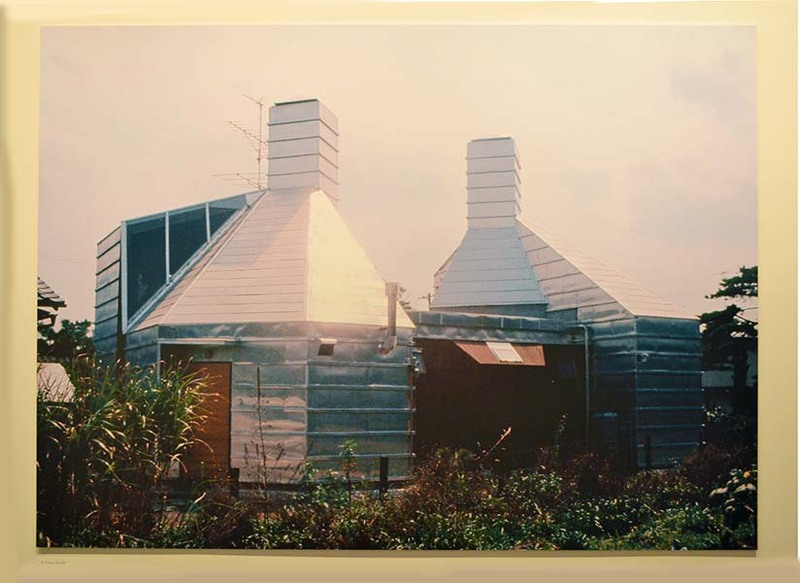 The “Silver Hut” is Toyo Ito’s own house. It is a highly acclaimed piece of architecture that marks the culmination of Ito’s work in the 80’s. 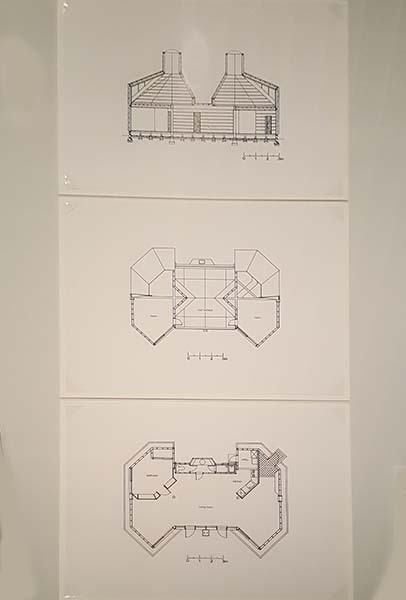 According to the presentation titled the “Temporariness of Architecture” Ito gave to 東西アスファルト事業協同組合 in 1987 (not related to this exhibit), he originally conceived this house as something like a boat house used in many Southwestern Asian regions. There are certain fundamental activities, such as sleeping or preparing meals, which require fixed, sturdy spaces. But Ito thought that other activities needed spaces that could be more flexible. So he stood concrete beams at modest intervals (3.6 meters), and covered them with a light, vault-shaped steel frame. The aerial photo gives the impression of a temporary fairground with modern tweaks. This house is fluid and retains a certain temporariness: for example, the patio was open when it was built, but Ito later decided to cover it with screens. Details and elements keep evolving, because it is a “hut” that could be changed based on the engagement of the people who live in it.